MTC note: In the following guest post, Missoula runner Tyson O'Connell shares an unusual encounter that occurred on a recent Sunday long run. Another reminder that Montana trail runners do, indeed, live and run in wild places. January 5, 2014: Today began like many other Sundays. I left Dean's house with Ken, Mark, Jed and Dean and we headed north along Rattlesnake Creek. At times we have up to a dozen runners on our Sunday run, but the temperature was in the single digits and the wind was a brisk 25mph, so only five of us launched at 8:30 am. To avoid the chilling wind we stuck close to the creek and then ran east up Woods Gulch toward Marshall Mountain. As we climbed Woods Gulch, we heard barking in the distance and Ken guessed it was hound dogs that may have treed a mountain lion. Eventually we made it to the top of Woods Gulch where I headed north and the rest of group went south. Thirty minutes later, I'd gained some more elevation and again heard the barking so I decided to scale the ridge and find the hounds. Eventually I came to a rocky outcropping and saw a group of hounds at the base of a large fir tree. The dogs were excited to see me and two of them ran over to greet me with their tails wagging. The rest stayed at the tree barking at the mountain lion that was sitting on a branch thirty feet from the ground. I watched the dogs and the lion interact for the next twenty minutes and eventually traversed down the mountain and back to Dean's house. 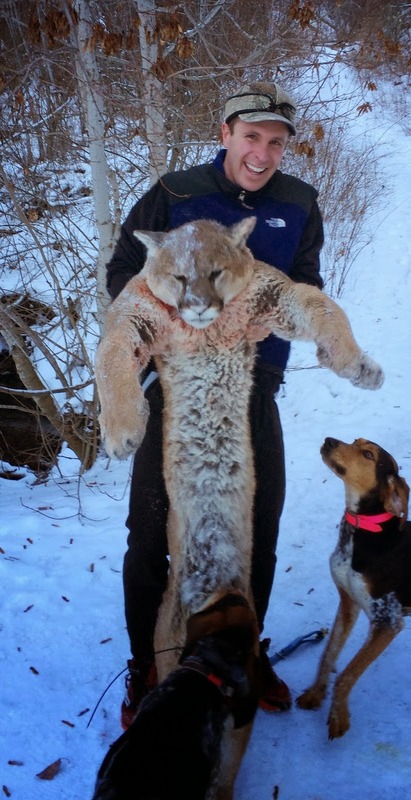 I picked up my truck and returned to the trailhead just in time to meet the hunters as they retrieved the mountain lion. They let me hoist the 140-pound lion for a picture. I then bid them farewell and then headed back to my house for brunch with my family. During brunch my wife asked, "How was the run?" I replied, "It was interesting." I then showed her the picture and told her the story. Now that I've had some time to reflect, I'm grateful that I had the chance to see the hounds and the lion in their element and even more grateful that I can leave my house on a run and have this type of experience just minutes from town. I think about my friends that live in other cities and other states and realize that we're all fortunate to live, hunt, and run in Missoula.